By reducing the materials, resources and power we need to build a car, we can reduce our impact on the environment. If we can use less, then we can also waste less. That is how the concept of reduction plays an important part in our mission to create the ultimate eco-car – one that has no impact on the environment at any point during its lifecycle. We strive to use less energy, less water and fewer raw materials when we make our cars, through intelligent design and efficient manufacturing processes. 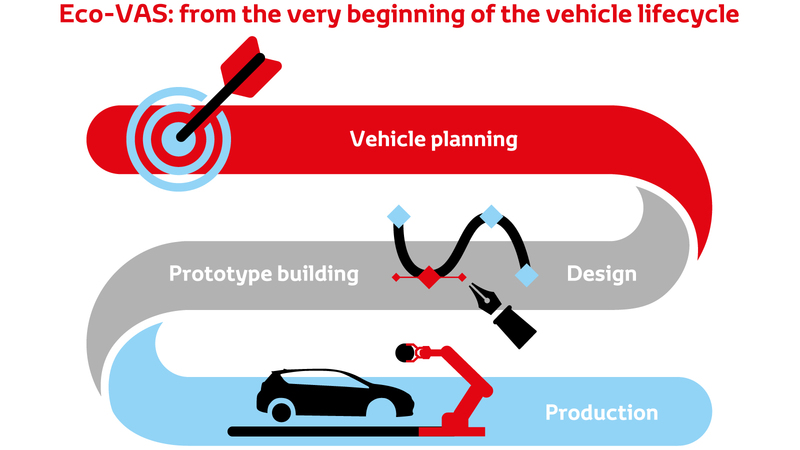 We research and apply innovative materials, new processes and smarter ways of working and monitor our progress against assessment targets for each vehicle at every stage from design, through production, customer use and eventual disposal. These figures* show the important areas in which we have achieved reductions to produce each and every car since our records began. Our efforts to reduce the environmental impact of our vehicles begin right at the start of the design process, inspiring clever new thinking about everything from how a car performs to the kind of materials we use to make it. To help us in our work to deliver greener vehicles with lower emissions and less impact on the world around us, it is essential that we have a strategy in place and can measure our progress. We have come up with a structured way of doing this – the Toyota Ecological Vehicle Assessment System, known as Eco-VAS. Using Eco-VAS, we can set targets for reducing environmental impacts as soon as we start to plan and develop a new vehicle. We produce a lifecycle assessment to show what its environmental impact will be, from design through production to customer use and eventual disposal at the end of its useful life. As a project moves from design to prototype and production, performance is constantly measured against the Eco-VAS targets. This meticulous approach has encouraged the development of new materials, such as bio-plastics and Toyota Super Olefin Polymer (TSOP), a polypropylene resin that is very strong, has high-impact resistance and can be recycled and integrated with other materials. We use TSOP widely both inside and outside our vehicles, for things such as instrument panels, trim parts and even bumpers. Our work in this area has also helped us discover new ways of putting recycled materials to good use. Reducing the weight of a vehicle is a fundamental way of helping cut both the amount of fuel it uses and the emissions it produces. To make the most of this opportunity, we look at how and where weight can be saved right from the design stage. We also look closely at every component to see how it might be made lighter, without compromising performance. The success of our new lightweight designs can be seen in our Hybrid Synergy Drive powertrain, which has progressively been made more compact and 20% lighter overall. Example of innovative material integration in the Prius II. Our design teams think carefully about how a vehicle will be used and in what kind of driving environment. This smart design approach helps reduce environmental impact and takes us closer to developing the ultimate eco-car. The i-ROAD is a good example of this concept, a compact all-electric vehicle that is easy to manoeuvre on urban streets, helping reduce congestion and producing no harmful exhaust emissions. Toyota i-ROAD currently undergoing trials in Grenoble, France. We have pioneered the development and use of plastics that are made from organic material, rather than oil-based products. We have been producing these carbon-neutral bio-plastics from sustainable plant crops since 2003, helping to achieve reductions in the CO2 emitted during a vehicle’s lifecycle. We were the first manufacturer in the world to develop a way of making injection-moulded bio-plastics, making it possible to use the material for components such as the instrument panel in the Prius. You will also find bio-plastics in soundproofing material, carpet mats and boot linings. Ecological plastic use has been increasing since 2003. REACH is the European regulation on the Registration, Evaluation and Authorisation of Chemicals. We are just as concerned about the environmental performance of our business operations as we are about the vehicles we make, so we are constantly seeking ways to reduce our demand on natural resources, our emissions, and the amount of waste we create. 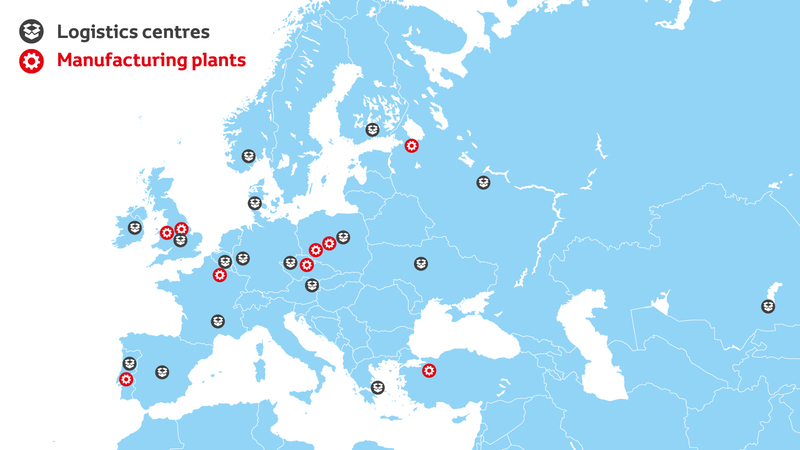 We are a major contributor to manufacturing across Europe, with production facilities making vehicles, engines and transmissions in the UK, France, the Czech Republic, Poland, Russia, Turkey and Portugal. We recognise the crucial importance of being a “good neighbour” everywhere we operate. This quality extends from being a good employer, to protecting and enhancing the environment and communities around us. We constantly seek new ways of reducing our use of natural resources and cutting our greenhouse gas emissions. We are using different methods to capture and use solar heating and electricity and are using renewable biomass as an alternative to gas for heating. We also work to achieve the most efficient methods of transporting parts and finished vehicles, using better logistics and transport methods with less environmental impact. Toyota Motor Manufacturing France’s factory in Valenciennes, home of the Yaris, uses heat from the sun as a carbon-free way of boosting its central heating system. It has set up a solar wall, a 410m2 sheet of perforated metal placed in front of the south wall of the building. This creates an air cavity which is heated by the sun. Using ventilation and natural convection, the hot air is fed into the system which heats the press shop where car body panels are stamped. Toyota Motor Manufacturing UK has reduced its carbon footprint by using solar energy to help power its factories. It operates one of British industry’s largest solar arrays at its Burnaston factory and a smaller system at its engine factory in North Wales. Together the 17,000 photovoltaic panels can produce almost 7,250mW/h of electricity, enough to make 7,000 cars and 22,500 engines a year. Water is a precious resource and we have made significant savings in the amount we need to build each vehicle. At Valenciennes we are also reducing the volume of water we take from the municipal supply by capturing rainwater in two big lagoons within the factory site. Measuring 6,200m2 and 10,380m2, these are helping us reduce our use of public water in our manufacturing processes to zero. The success of this scheme has earned Toyota Motor Manufacturing France a top platinum award in our internal Global Environmental Award programme. The Valenciennes factory has reduced its greenhouse gas emissions by changing one of its gas boilers to one powered by burning biomass pellets. Developed in partnership with the energy specialists EDF Optimal Solutions, the boiler was put into service in March 2015. Capable of generating 1000kW, it is used to maintain a constant temperature in processes used for vehicle surface treatment. The shipping of parts and vehicles to and from our factories is an area where we can reduce carbon emissions by thinking how we can transport items efficiently, with the least waste. Teams work together and look closely at the different types and shapes of items we use so as to come up with packaging that allows as many items as possible to be carried at one time, whether by road or rail. The results are better space efficiency, lower CO2 emissions and packaging that is easier to fill, load and unload. We encourage new ideas like this in our annual Global Eco Awards, and our European Parts Depot in Belgium has been among the winners for its innovative solutions in this area. The transport of parts and products provides many opportunities for us to reduce our overall emissions levels, working in partnership with our shipping and supply chain partners. We seek to make use of lower emission transport options, using sea and rail as alternatives to long-distance road haulage. It is also important to use energy-efficient vehicles, including those which run on alternative fuels. Drivers are given support to learn eco-driving techniques and we encourage the planning of routes that allow vehicles to run as efficiently as possible. Making the best use of vehicle cargo space is also important, avoiding empty running after deliveries and, where possible delivering direct to customers to avoid journeys to and from warehouses.